Xerox, like any other manufacturer, cannot ensure that all machines are going to last a certain time, perform at a guaranteed speed, or promise zero mechanical issues. The bottom line is these machines are made up of hundreds of components, many of them moving. Parts get dirty and worn down, or become misaligned, causing a number of problems. Many issues will require a repair by a professional, but not all. Here is a list of the most common problems and/or questions as well as potential do-it-yourself troubleshooting techniques. 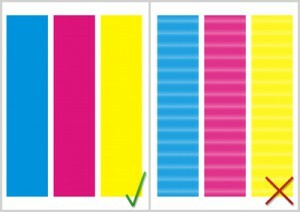 When you are printing, you can select the type of media you are printing on. Be sure that your settings match the paper that is loaded into the machine. If the two do not match, the quality may suffer. Certain media types cannot handle the same fuser heat as others. For instance, envelopes with adhesive exposed to the heat of the fuser could be ruined. Many fusers in laser printers can be manually adjusted to make it conducive with specific media types. Check with the user’s guide of your Xerox laser printer as well as the label of the paper type you are using to ensure it is designed for use in a laser printer. Open your machine and look at some of the major components, such as the ink sticks or cartridges, fuser, rollers, etc. Check for obvious damage or scratches. If you find some, you may have to replace that part. If you do not find actual damage, wipe the parts down with a towel. It is possible that dust particles or ink residue are hindering performance. If your documents have smudges on them, Xerox recommends printing a bunch of blank pages. This can help to clean the rollers and reduce smudges. Remove the paper tray, and check the paper path as well as you can. You are looking for any debris, such as chunks of paper or tape. Remove anything you find. Be sure the paper is loaded completely straight in the tray. Use the alignment guides. Pull jammed paper out of the machine as straight as you can. However, if it is stuck very tightly, do not keep pulling! Depending on which part of the path the paper is stuck in, there should be an access panel you can open or unlock to take the pressure off the paper. This will eliminate the possibility of tearing the jammed paper and leaving debris. Check your manual for specific instructions for clearing a paper jam for your model. Check to see if the paper loaded in the tray has static electricity, which makes the sheets cling to each other. This can usually be fixed by simply fanning the paper. Make sure the media type that you have selected is supported by the printer. Implement proper paper care tactics to ensure the paper is not creased or moist. Be sure you set your Xerox printer as the default. 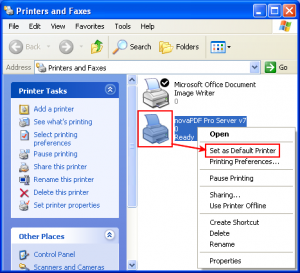 This can be done by going to the Start menu> Printer and Faxes> right click on your printer> Set as Default. Clear the print queue. Sometimes a task can get stuck in the queue, and then everything sent after that will line up behind the stuck task. You can try deleting the stuck job from the queue, but you might want to just restart the machine (and possibly the computer as well) to clear the queue entirely. Load the appropriate tray with the correct paper supply. What is the print mode set to? It takes longer to print a document at high resolution. If the print job does not require the utmost quality (such as a copy of an invoice), set the mode to Draft. In this low-resolution mode, less ink/toner will be applied to the page, so it will pass through the printer faster. Images and complex graphics will take longer to complete than standard text documents. Consider upgrading your printer’s memory if the printing demands are becoming too much for the machine to handle. If you have pulled out all the stops and are stilling having issues, be sure to contact a customer service representative at Xerox or the establishment where you purchased your machine.